With good weather enticing people out of their homes, into their cars and onto their bicycles, most of us associate August as the heart of summer. It’s a chance to enjoy the sunshine, head to the beach and enjoy days out with the kids. But for some, August holds a more poignant association as National Road Victim Month, led by the road crash charity RoadPeace. With more vehicles on the road than at any other time of year, the potential for collisions is heightened over the summer. But with driving conditions arguably better than at any time of year due to improved weather conditions and visibility, what are the factors that could turn a summer of fun into a summer of tragedy? There are several avenues to be explored, starting with the sheer volume of traffic. According to the Department for Transport, between 2012 and 2016 average figures showed traffic flow was highest on the motorways in August and on rural roads in July. The same statistics also showed the number of miles travelled by cyclists and motorcyclists was 75 per cent higher over summer compared to winter. Other factors link to the vehicles themselves. Advice from the RAC warns that hot summer temperatures can affect vehicle performance increasing the risks of tyre punctures, overheating and fuel inefficiency. But aside from the technical issues, there are also the human behaviours to consider. The idea of whiling away the summer at barbecues, festivals or in pub gardens lends itself to more situations which could tempt drivers to drink and drive. Equally, research by the RAC shows more children are more likely to be killed in road traffic accidents in summer due to increased exposure to the risk through playing outside or walking and cycling to school. Additionally, a report by the Independent earlier this year, based on information provided by Admiral insurance, showed drivers were more likely to speed during the summer. And with more people travelling unfamiliar routes for staycations or days out, any of the above scenarios could lead to tragedy. Last September, the Devon Live reported six adults and three children were killed on the county’s roads between the end of July and end of August. To reduce future accidents, Devon County Council submitted a Safer Roads Funding bid to the Department for Transport and in June, was awarded £4 million to improve the A3121 and A3123 which were subject to 27 collisions between 2012 and 2016, including three fatalities. Devon County Council states 80 per cent of accidents on its roads are caused by driver error, through behaviour such as speeding or not knowing the roads. Whilst it cannot be held accountable for how people use the roads, the council is responsible for the condition and safety of them. The Safer Roads funding will be used to undertake major junction improvements, particularly at two collision cluster sites and improve the majority of minor road junctions on the route to an improved and consistent safety standard. It will also provide more enhanced and consistent signing and lining at junctions which altogether, is expected to save 55 lives on these two routes. The proposals put forward by the council are consistent with the solutions offered by Clearview Intelligence. Our Active Road Studs improve hazard perception at junctions and on winding roads by allowing drivers to see much further ahead on the road. These can be combined with hardwired studs and vehicle activated signs (VAS) which respond to speeding drivers to highlight a hazardous stretch of road even further. To combat the issue of speed, we have utilised wireless vehicle detection to detect speeding drivers who are then presented with a ‘Slow down’ warning message on VAS and a red light at traffic signals. 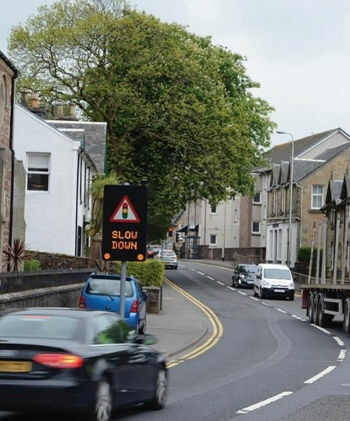 This proved to be an effective solution in Fairlie in Scotland (pictured) to reduce the number of vehicles who consistently sped through the small village. VAS that respond to what is happening on the road ahead are also effective at reducing accidents at junctions. By detecting vehicles waiting to turn at a junction as well as the speed of drivers travelling along the main route and presenting drivers with either a ‘Vehicles turning’ or ‘Slow down’ message they have been found to significantly reduce the number of accidents. As a road operator, safety has to be paramount and every feasible step should be taken to ensure any potential hazards are addressed and all risks averted. Whilst it will never be possible to control the actions of drivers, it is possible to ensure that the network they use does not contribute additional risks to their journeys and this responsibility sits with the operator. Simple solutions such as those highlighted above are available to be utilised and will cost far less than the priceless loss of life.